Multi award winning professional artist and tutor Jacky Pearson is fascinated by light and atmosphere, which is the driving force for her to paint. Whilst she specialises in watercolours, loving the sense of freedom and spontaneity that this medium does best, oils, pastels and pencil work are also a frequent part of Jacky’s work. Born in 1958 in England, Jacky and her family moved to New Zealand in 1991. She has loved to paint and draw from a very early age and although she has had a career in soil conservation and assisting her husband in a renewable energy business she now paints full time. Self taught, Jacky has also attended workshops with some of the world’s top watercolour artists. Jacky exhibits in galleries and holds Solo and joint exhibitions around New Zealand and overseas. Her work is held in private and public collections in NZ and abroad. A watercolour “Save our Trolleys” represents New Zealand in the permanent collection the International Museum of Watercolours in Mexico. Jacky has won numerous awards including the 2009 and 2010 Raye Hannan Memorial Trophy and Gold Medal for Most Successful Artist of the Royal Easter Show in Auckland She is also, represented in the book “Splash 11” and in 2015 "Splash 16" the North American publication show casing international watercolours. Jacky was awarded overall winner in the national Wai - Portrait Awards 2011 and in 2012 awarded public vote for “best in the show” Rotary Southwards art show. 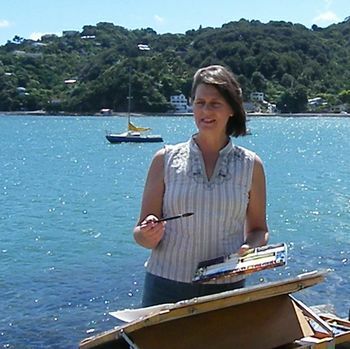 Her work features in numerous books, magazines and calendars including Denis Robinson’s books “NZ in Watercolour”, “Artists Impressions of NZ” and ”Christchurch, an artists tribute”. Jacky has also published a series of three calendars covering all NZ's classical coastal lighthouses. She has featured in various art magazines including The New Zealand Artist, issue number 2. Jacky has been filmed painting a portrait "Smoko Time" for the Australian TV programme "Put Some Colour in your Life". The painting can be seen on my gallery page.